White House press secretary Sean Spicer speaks during a daily press briefing at the White House in Washington, Monday, Feb. 27, 2017. SEATTLE (AP) — A federal appeals court on Monday denied a request from the U.S. Justice Department to put President Donald Trump's travel ban case on hold until he issues a new executive order. A three-judge panel of the 9th U.S. Circuit Court of Appeals did not give an explanation for its ruling but said it would extend until next week the deadline for the government's opening brief in its appeal. A lower court temporarily blocked Trump's order that banned travelers from seven predominantly Muslim countries and paused the U.S. refugee program after Washington state and Minnesota sued to stop it. Trump tweeted "SEE YOU IN COURT" after the 9th Circuit refused to reinstate the ban, but he also has said repeatedly that his administration is working on a new travel ban that addresses some of the constitutional concerns that critics have raised. 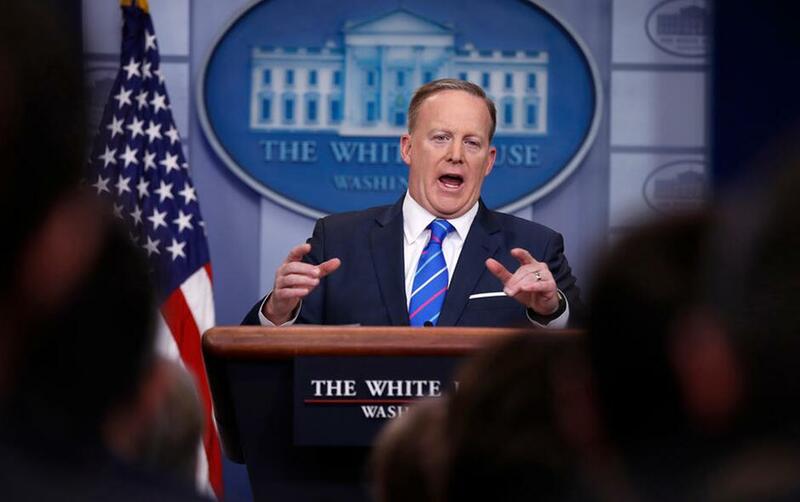 White House Press Secretary Sean Spicer was asked during a briefing Monday why the administration wants to defend the ban in court if it's writing a new one. He said the government would defend the appeals case "because we were right the first time." "While the new executive order attempts to address the court's concerns that they made, the goal is obviously to maintain the way that we did it the first time because we believe that the law is very clear about giving the president the authority that he needs to protect the country," Spicer said. Nicole Navas, a Justice Department spokeswoman, declined to comment on why the agency sought to put the case on hold while the administration is publicly saying it wants to fight it. The states objected to pausing the appeal, saying in a motion late Friday that it appears the White House and Justice Department are not communicating. "Despite the Trump administration's repeated requests for delay, the courts agree with my office that this case should move forward," Washington state Attorney General Bob Ferguson said Monday in an email. The states said "the president has not rescinded the executive order and has not issued a new executive order." Because Trump has not rescinded the current order, court briefings on the preliminary injunction should proceed, the states said. The appeals court said the government's brief is due March 10 instead of Friday.